IRS Form 2555, "Foreign Earned Income" is a tax form issued by the United States Internal Revenue Service. The latest version of the form was released in January 1, 2017. A up-to-date fillable 2555 Form in PDF is available for download below. The IRS-issued "Foreign Earned Income" is available for digital filing or can be filled out through the Adobe Reader application on your desktop or mobile device. the Instructions for Form 1040 if you enter an amount on lines 45 or 50. Go to www.irs.gov/Form2555 for instructions and the latest information. 6 a If you previously filed Form 2555 or Form 2555-EZ, enter the last year you filed the form. and go to line 7.
c Have you ever revoked either of the exclusions? . d If you answered “Yes,” enter the type of exclusion and the tax year for which the revocation was effective. Of what country are you a citizen/national? maintained a second household at that address. List your tax home(s) during your tax year and date(s) established. the information asked for, any exclusion or deduction you claim may be disallowed. 12a Did any of your family live with you abroad during any part of the tax year? . b If “Yes,” who and for what period? residence that you aren't a resident of that country? See instructions . b Are you required to pay income tax to the country where you claim bona fide residence? See instructions . the income from column (d) in Part IV, but report it on Form 1040. 15a List any contractual terms or other conditions relating to the length of your employment abroad. b Enter the type of visa under which you entered the foreign country. c Did your visa limit the length of your stay or employment in a foreign country? If “Yes,” attach explanation . d Did you maintain a home in the United States while living abroad? . 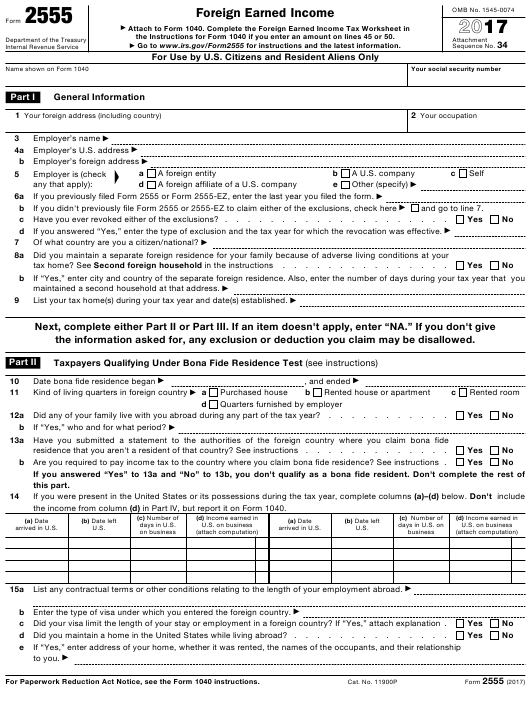 For Paperwork Reduction Act Notice, see the Form 1040 instructions. Enter your principal country of employment during your tax year. foreign countries that didn't involve travel on or over international waters, or in or over the United States, for 24 hours or more. month period.” Don't include the income from column (f) below in Part IV, but report it on Form 1040. (f) Income earned in U.S.
Total wages, salaries, bonuses, commissions, etc. a In a business (including farming) or profession . b In a partnership. List partnership’s name and address and type of income. d Other property or facilities. List type and amount. For any other purpose. List type and amount. Other foreign earned income. List type and amount. Total amount of meals and lodging included on line 24 that is excludable (see instructions) . Enter the amount from line 26 . No. Go to Part VII. Qualified housing expenses for the tax year (see instructions) . Enter the smaller of line 28 or line 29b . Enter employer-provided amounts (see instructions) . don't enter more than “1.000” . amount on line 34. Also, complete Part VIII . income exclusion, complete Parts VII and VIII before Part IX. • If you completed Part VI, enter the number from line 31.
fall within your 2017 tax year (see the instructions for line 31). a decimal (rounded to at least three places). to the excluded income. See instructions and attach computation . Subtract line 44 from line 43. Enter the result here and in parentheses on Form 1040, line 21. (b) line 27 is more than line 43.
figure the amount to enter on line 49. Otherwise, go to line 50.